That was a reference to the German right-wing social democrats’ likely collusion with the proto-fascist Freikorps in the murder of the 47-year-old Luxemburg in January 1919, just days after her Spartakus Bund, a radical faction of the German Socialist Party, quit the SPD and changed its name to the German Communist Party. I believe leftists, whether friend or foe, exaggerate the differences Luxemburg had with Lenin over the central role of the party in workers’ struggles, ignoring the context in which the two worked and giving each one’s ideas a trans-historic importance. Luxemburg is seen as the inveterate democrat and Lenin as the scheming organization man. They had differences, sure—who wouldn’t—but those are caricatures either of them would and did reject. Many of the differences between Luxemburg and Lenin owe more to conditions prevalent in their respective countries than real ideological disagreements. Lenin was forced by circumstances to lead an illegal, underground and tightly ideological party tailored to a despotic, backward, absolutist feudal state with no right-wing socialist current to contend with. Luxemburg for her part pushed for a radical politics in a legal, mass, multi-tendency party run by full-time bureaucrats and conservatized labor leaders in a largely democratic, highly industrialized western nation. There was no huge gulf between Luxemburg and Lenin, I believe, but comradely differences based on history and place. Sadly, too, many Leninists insisted that Luxemburg gave short shrift to organization, with her allegedly believing instead in the spontaneity of masses of people fed up with the rule of capital and rising up without much aid from organized parties. In fact she believed in organization. Her writings on Poland and the need for a tight party even rivaled Lenin’s, given repressive conditions in Poland. Just a side note on the sin of spontaneity: As a veteran socialist and union militant once told me about what the notion really connotes, “Spontaneity means somebody else did the organizing.” Much truth there. What Luxemburg could not do was build a united radical opposition to the revisionist, drearily reform-minded trend in the German Socialist party. Unlike Lenin, she spent the war years in prison. Released after the armistice, she was murdered just months later, her last days no career path for building a democratic, mass party. For those of us who think reform and revolution are concepts tied at the hip, Luxemburg is likely the most important Marxist to speak about politics as practiced in Western democratic societies, and that includes even Antonio Gramsci. 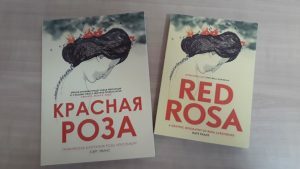 I won’t bury Lenin, but I do think we as western radicals have more to learn from Red Rosa than from Vladimir, particularly in her invocation of workers councils (just as Lenin did) and in the value of mass strikes, themselves educational opportunities as well as insurrectionary moments. In many ways, the Bernstein epigram encapsulates and anticipates what is now traditional western liberalism; that is, the idea that capitalism per se is not the problem but that disparities in great wealth are, and that a democratic society would offer remediation and justice to the poor. Electing liberals and safeguarding unions alone would tamp down injustices, while capital’s own development through credit, cartels and advanced forms of communication would stabilize capitalism, socialize it of necessity and in itself create a desirable social peace. a firm and conscious effort for the conquest of political power (which) impregnates the trade union struggle and the work for social reforms. But if this effort is separated from the movement itself and social reforms are made an end in themselves, then such activity does not lead to the final goal of socialism but moves in a completely opposite direction. Her defense of reforms was not based on reforming capitalism but in giving masses of working people victories that would encourage them to fight for more. For her, as she wrote, “What parliamentarism expresses . . . is capitalist society,” that is to say a society in which capitalist interests predominate. That was not in contradistinction to her 1906 essay on the mass strike, which urged the party to shift its tactical emphasis to action and away from an overindulgence on purely organizational and education issues. She believed that direct experience in political struggles was more salient and enduring than lessons learned through speeches and publications. Then we wouldn’t just be celebrating the victory of a handful of insurgents, such as DSA’s Alexandria Ocasio-Cortez and Rashida Tlaib, but a mass movement making history. This essay is adapted and updated from a talk given in June 2018 to the New York City Lower Manhattan branch and later reprinted on the New Politics site. 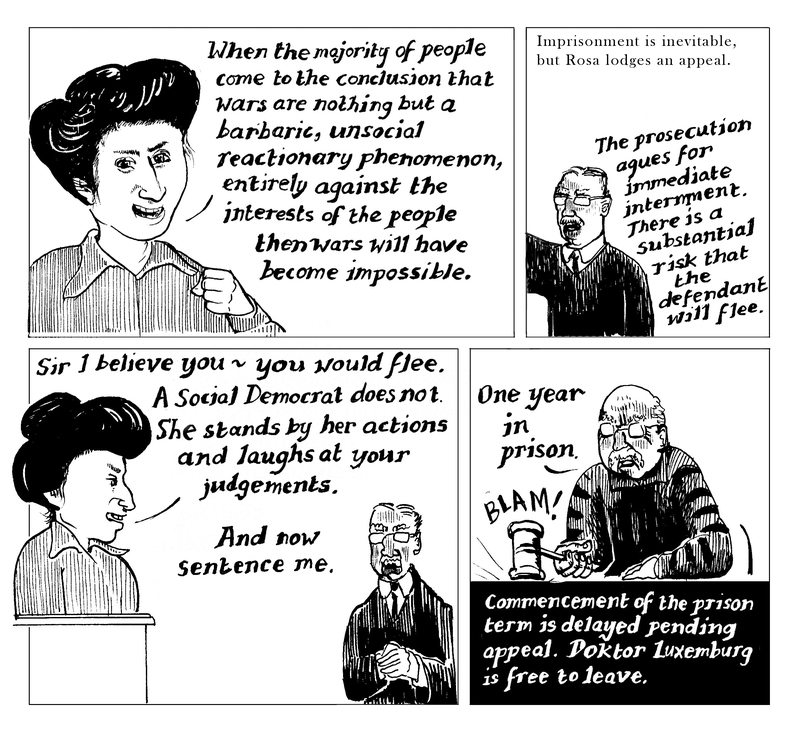 All art, and the video above, from Red Rosa: A Graphic Biography of Rosa Luxumburg by Kate Evans, Edited by Paul Buhle (Verso, 2019). For more, see “Rosa Luxumburg for Today” by Nichole Shippen, Democratic Left, August 13, 2014. Michael Hirsch is a New York City-based writer, union activist and member of the DSA Lower Manhattan and Labor branches. He is also on the editorial board of New Politics and a moderator for the Portside news service.